For those of you who don’t know it was only in the 90’s when Kydex, LLC was born. It may be that initially, Kydex (which is in fact a plastic) was discovered by mistake, but nowadays everyone one know that Kydex sheets may be molded into so many shapes, by applying heat. Obviously, enough, not all Kydex holsters are the same quality and a bit of attention wouldn’t hurt when shopping. Some may not even bother considering to get a Kydex holster as leather can’t be beat, from their point of view. Sure enough, leather holsters look nice, smell great and are typically very quiet. Nevertheless, they are also sensitive to temperature, humidity and even moisture. You need to give time to a leather holster to break in and also to dry out in case it gets wet. Some even pinpoint that leather holsters aren’t the safest out there either. The more we think about it, the more we believe that efficiency is what we like the most on a kydex holster. It’s ready to wear right out of the box, doesn’t get dirty or dusty and it’s basically maintenance-free. We do have to admit that un-holstering and re-holstering is a bit louder, but this fades away when we talk about the high security of re-holstering a Kydex holster. Kydex holsters don’t perform differently if there’s moisture or if the temperature changes. In a nutshell, Kydex holsters aren’t that sensitive and are reliable, no matter how hot/cold it gets outside. Not all Kydex holsters are the same and there are many things that have a say on its quality. The thickness, the ability to perform no matter the environment’s temperature, grain influence the sheet’s grade. If you ever get your eyes on a Kydex T or Kydex 100, don’t hesitate and get that holster. These are the most popular Kydex out there, as they are tough, durable and chemical resistant. It’s a matter of time in most cases until your holster wears the finish of your gun. In order to avoid that, Kydex holsters are made exactly on the shape and form of your gun. This way the holster only applies pressure on the specified areas of the gun. Finding a perfect match for your gun is the key of not wearing it with the new holster. 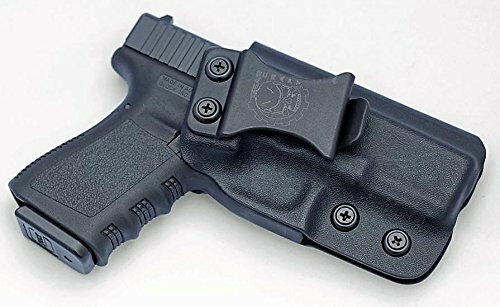 The Fierce Defender IWB (Inside Waistband) Kydex Holster Glock 19 23 32 “Winter Warrior Series isn’t the best Kydex holster on the market for sure. 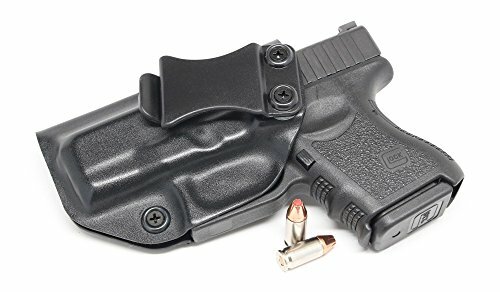 However, at the same time, the holster surpasses the expectations as it manages to be reliable, comfortable and efficient for a very low price. The holster is in fact with .08 thick Kydex so it’s quite long lasting and tough, taking the intense use pretty good. The holster is molded especially for your weapon, giving a snug fit. It covers the trigger entirely and the backside of your gun. This increases the secure carry but also protects you and your gun from corrosive perspiration. The list of functional features isn’t short, as some may expect. 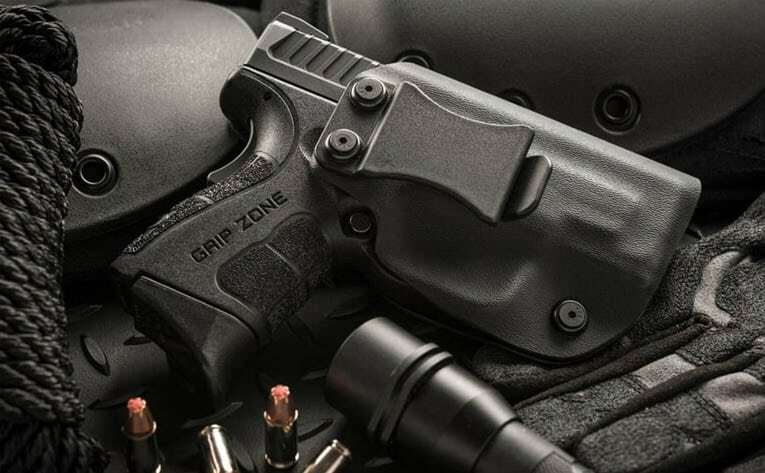 By contrary, the holster presents adjustable retention (for the right fit) and a flared opening that makes the re-holstering smooth and easy. In addition, guess what? The holster also comes with an adjustable cant so you may set up the degree from 0 to 30. The clip is wide and long, fitting so many types of belts. The retention is good and the tension screw is functional. The holster looks great and feels nice also. Its low profile makes it comfortable and the holster is easy to put on/take off. The holster is well made and leaves a durable feeling. All in all, for a very good price, you get a dependable, low profile holster that may serve you well for a good amount of time. Proudly made here at home in our USA, the S&W M&P Shield 9/40 IWB Kydex Concealed Carry Holster doesn’t surprise anyone with its reliability or good built. The holster is made with .08” thick Kydex and fits belts up to 1.75”. 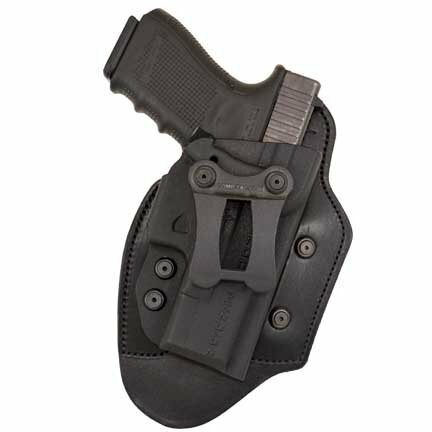 It presents plenty of functional features that create a pretty versatile and dependable holster. You may wear it both rear and front, thus becoming more versatile. We notice the easy to adjust retention pressure and the adjustable carry angle (also known as cant) that lets you set the angle from 0 to 15 degrees. The list of good things continues with the positive-click Retention Lock system that is very easy to hear. The holster comes also with a full sweat shield that protects you and the gun from corrosive perspiration. The belt clips is strong and secures tightly the holster. The draw and re-holstering is easy and the holster conceals perfectly inside. The minimal design doesn’t make the holster less efficient. By contrary, it helps with the comfort, as it doesn’t include unnecessary bulk. Nevertheless, for the multiple good things and reliability, we think the holster is a good option when shopping on a fixed budget. When in need for a good Kydex holster for your Glock 26, 27 or 33, a very good option is Concealment Express IWB KYDEX Holster. The holster is has a small foot print and a low profile which means it’s comfortable to wear all the time. Even though its design is minimalistic, the holster manages to be efficient and reliable, to say the least. We notice the retention pressure that is easy adjustable and the carry angle that is easy to set according to your needs (from 0 to 15 degrees). The holster features also a 1.5” belt clip that works pretty well and is quite strong. The “Posi-Click” retention lock system is easy to hear, letting you know you’re good to go. The retention is good and so is the sight channel. Among the good features, we also see the full sweat shield that protects against moisture, minimizing risk to wear out your weapon. We like the low profile of the holster that makes it comfortable and not easy to spot at the same time. It’s easy to put the holster on and take it off. The holster is made here at home in our USA and presents nice fit and finish. We don’t mind that much about the cons, as they are minimal and recommend the holster as a great option when in need for some of your Glock models. 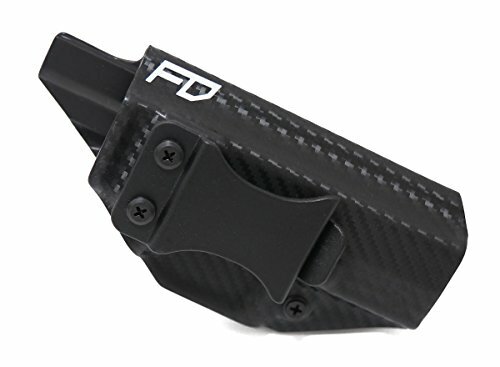 We like many things on the DeSantis Invader inside the Waistband Holster Springfield Armory XDS, the fact is made with Kydex, and nylon black is just one to begin with. The holster is made here at home in our USA and is durable, taking the intense use. It’s molded to fit your Springfield XDS, for right-hand use. Its body pad is made with neoprene, ballistic nylon and various synthetic materials, whereas the formed holster component is made with thermos-molded Kydex sheet. The holster comes with C-clips that are also tough as they are made of glass-reinforced nylon. They have a good design and are reliable. We also like the holster because is comfortable and tuck able just as well. It’s pretty versatile and easy to adjust thanks to its included hex wrench. The holster has good retention and doesn’t wear your gun. It doesn’t dig into your skin and doesn’t irritate your skin either. It’s easy to put on/take off and holds your weapon pretty good. We put the minor cons aside and only look at the good part as it gives us the image of a reliable, versatile and well-made Kydex holster. Comfortable and easy to put on/take off, the Gear craft – Glock 19 IWB is another Kydex holster that makes it to our Top 10. The holster is made with tough and long lasting .080 thick Kydex here at home in our USA. Its design to give a snug fit to several Glock models: 12, 23 and 32. Besides the good quality materials, the holster presents several features that explain its good performance. The adjustable cant on the holster is so helpful and you can set the carry angle from zero to 15 degrees, depending on your carry position. Either you choose the traditional or the appendix carry position, the holster is reliable. Not only is the cant adjustable on the holster, but the tension also. The adjustable tension provides the snug fit on the gun at all times. We also need to mention the full-length custom sweat guard that helps when re-holstering, protecting the finish of your gun at the same time. The list of features also includes a FOMI injection molded IWB belt clip so that it fits belts up to 1.75”. The holster encloses the trigger entirely, minimizing risk for incidental firing. The retention is good and the concealment is dependable. The holster gives a perfect fit to your gun and carries just right. All in all, we like the holster for the safety, reliability and tough build and don’t mind about the minor issues. Taking a closer look at the Galco Triton Kydex IWB Holster for Glock 26, 27, 33 shows us a holster that it’s not only durable, but also tough enough to be used by law enforcement and citizens just as well. The holster is made with tough Kydex and it’s not only long lasting, ready to take the intense use, but also very easy to take care of. Another reason for us liking the holster it’s the fact that is so thin and easy to conceal. This doesn’t mean it’s any less firm. 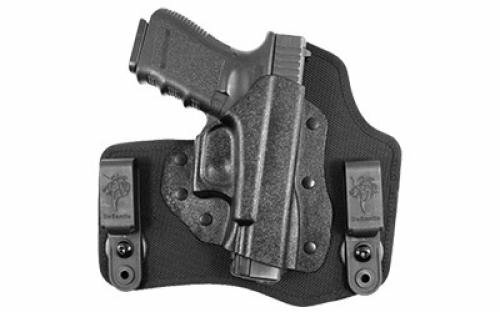 By contrary, the holster has a rugged built and ensures fast and smooth draw and re-holstering. The holster features a good belt clip so that it’s very easy to put it on/take it off. It fits belts up to 13/4”. A sweat guard protects you and your gun from corrosive perspiration, increasing the value of the holster. The retention is very positive and the concealment is very good. The holster sits well and may be used for various carry positions. It gives a good fit and function very well. Despite the minor issues, we wouldn’t mind giving a try with the holster as it’s dependable, thin and tough and doesn’t bring many problems. What makes the Comp-Tac MTAC Holster – 1.50 Black Standard Clips stand out from so many models is its spare interchangeable body. This means you may actually remove the Kydex part of the holster and fit another one. The holster becomes highly versatile and able to fit, in fact, any kind of gun. Apart from this essential feature, the holster comes with so many other good things. It’s tuck able and has a slim profile, which makes it easy to hide and comfortable to wear. The holster presents plenty of adjustable features; the cant and the ride depth are adjustable, giving you the chance to find the right setting for carry every single time. The retention is also adjustable and you can actually set it for very tight or very loose. You may also re-position the clips on the holster so that it rides lower or higher on the holster. The clips are also interchangeable and you may swap out for various colors, styles and belt widths. Not only the design of the holster is special, but also its construction. 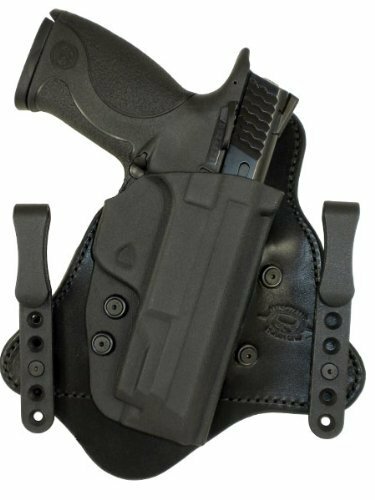 The holster features a leather backing that helps with it nice look and increases comfort at the same time. On the other hand, the Kydex half-shell ensures consistent draw and fast re-holstering. The holster is well made and leaves a durability feel. For its versatility, reliability and several adjustable features, the holster remains a very good choice for so many of us. Small, compact and giving almost no imprinting, the Vedder Holsters LightTuck IWB Kydex Gun Holster – Glock 42 .380 is a great option for anyone owning a Glock 42. However, there’s more than just as small footprint or minimal imprinting on the holster and going through the details may give you the clear image on it. 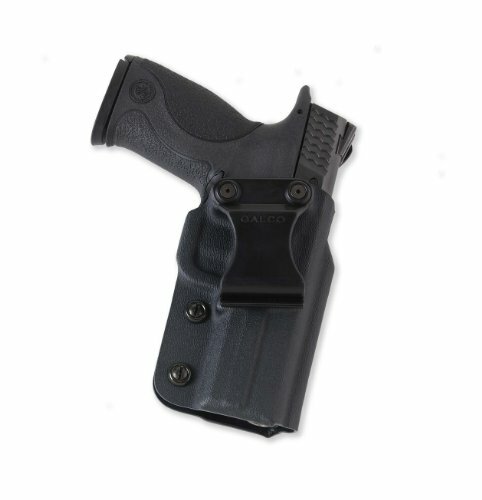 The holster is made of tough and long lasting Kydex and has a rugged build, without adding the bulk. We’d say in fact that its profile is very slim and subtle, which explains the minimal printing. It’s precisely molded to your gun, ensuring a snug fit for it. As a matter of fact, the holster is quite lightweight too. We like the holster also because it gives you easy and fast access to your Glock, every single time. As for the adjustments, you get plenty of options just as well. 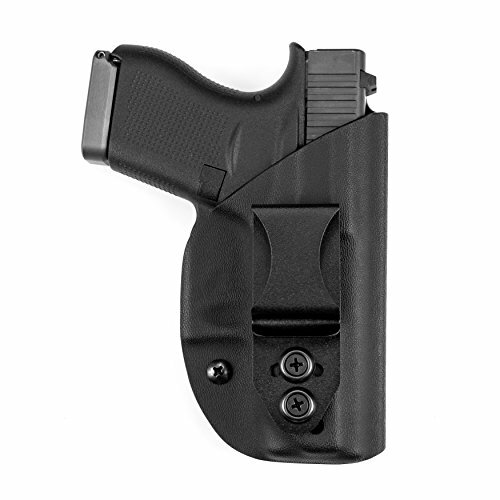 The holster presents an adjustable ride height, cant angle and reliable retention. You may carry the holster in various positions, according to your needs. The holster also presents custom channels that fit common sights and indicators. No worries on corrosive perspiration either with this one since it features a sweat shield that protects you and your gun altogether. The gun slides nice and smooth every time and the risk for scratches is minimal. This may seal the deal for many: the holster is handcrafted here at home in our USA. This explains the good construction and the durable built. We sure don’t consider the minor flaws to be deal breakers and we’re still quite infatuated with the small, low profile and dependable Kydex holster. 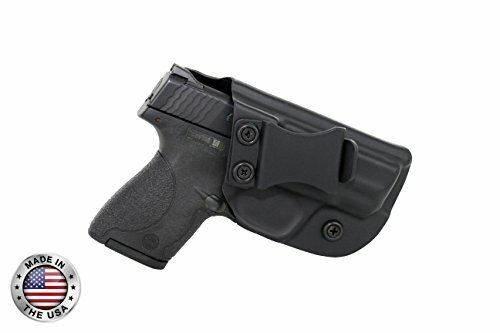 Highly versatile as you may carry it IWB or OWB the Comp-Tac Flat line Holster conceals very well your gun and has a low profile at the same time. The holster is made of Kydex and is especially molded for your gun, giving a snug fit every time. The versatility of the holster comes from its multiple features. For instance, the holster features no less than three sets of clips: Flat line clips (for OWB) of 1.5”, Standard Clips (for IWB) for 1.5” wide belt and Flat line, Offset clips (OWB) 1.5”. The holster also comes with additional mounting options that fit precisely your needs at one moment. Let’s mention also that the Flat line clips are made of flexible plastic, but hold tightly and safely at the same time. The clips are also cut with a curve so that the belt curves comfortably around your body. The draw and the re-holstering are fast and smooth every time. The holster is a great option for the big guys and its compact shape ensures comfort all the time. The holster has a strong built and you may wear it in any position. The ride depth is also adjustable and so is the cant on the holster. The minor drawbacks don’t makes us change our mind when we recommend the holster as a versatile, dependable and functional Kydex holster. The more you are willing to pay, the more you can expect when it comes to quality and performance from your IWB holster. The Comp-Tac IU Max Holster isn’t for sure the cheapest option out there and it’s worth every single penny, even though they are quite a few. The combination of the high quality materials explains the durability and versatility of the holster. The holster is made in fact with Kydex and leather, so it’s both tough, comfortable and nice looking. The top grain cowhide leather backing is soft and gentle on your skin, with minimal risk for irritating it. It’s in fact flexible and soft and doesn’t pinch nor rub. The leather backing combines efficiently with the Kydex body that is rigid, yet molded for a customized fit for your gun. The Kydex body doesn’t bend or wear out in time and it’s highly resistant to sweat and various solvents. 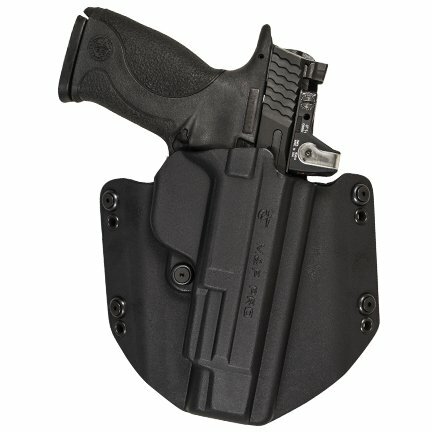 Additionally, the Kydex body is also interchangeable so you may holster any gun you have. The draw and re-holstering are smooth and fast and you only need a hand to do it. You can choose from the two mounting options: the Comp-Tac I Clip or the I belt Loops, also made of cowhide leather. The adjustments on the holster are many and the cant adjustment holes lets you change from a reverse cant, to a straight drop speed cant and FBI forward cant. The different cants help you wear the holster from 2:00 to 5:00 position on the body. It’s easy to put on/take off the holster. The holster conceals well and has a solid build. It’s well designed and comfortable to wear. Dependable, durable and so versatile, the holster is a great option to consider, even though it comes with some minor flaws.